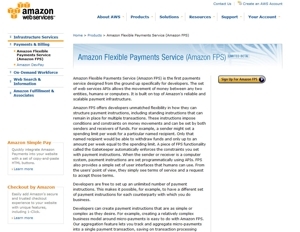 Amazon.com has been offering a beta version of its Flexible Payment Service (FPS) to merchants for almost a year now. With many developer-friendly features, some sellers could benefit from adding Amazon FPS to their payment options, especially if they’re already using Amazon to sell their products. Launched in August 2007 as a competitor to PayPal, San Jose, Calif. and Google, Mountain View, Calif., Amazon FPS was touted as being “the first payments service designed from the ground up specifically for developers.” It promised loads of adaptability and a simplified cost structure. Perhaps FPS’s most interesting trick is the ability to create many sets of transaction rules at virtually any point in the payment process. For example, suppose an online shoe retailer in San Jose, Calif. and a brick-and-mortar shoe store in Toronto, Ont., Canada decide to create a limited relationship to save money on shipping or create more sales. If the San Jose retailer gets an online order from Eastern Canada, he wants his partner, the Toronto-based shoe store, to fulfill the order, saving time and shipping charges. The shoe store in Canada gets a sale and the online store in San Jose gets a share of the profit in the form of a fee. Amazon FPS does make this somewhat complicated arrangement manageable, programmatically dividing the payment between the San Jose and Toronto merchants and managing bank fees in a fashion that is seamless to customers and basically hassle-free to both sellers. The ecommerce merchant in San Jose could even develop a number of alliances with partners around the country or the world, creating specific payment instructions to properly manage revenues automatically. Amazon FPS can also collect and tally micro-payments, aggregating dozens or even hundreds of small charges, billing before or after a product or service is delivered. Imagine an online toy store that wanted to offer a lay-away option that could also be educational for children. Parents sign up their child and schedule a weekly “allowance payment” of $.50 or $.25. The child would be responsible for saving up funds for bigger items and could be rewarded with discounts for saving up more money. Parents help their kids learn a lesson about saving money and merchants get a guaranteed sale and can collect interest to offset the aforementioned discounts. Now imagine making a transaction like that work on your current payment system. “Amazon FPS enables tens of millions of existing Amazon customers to transact on your application with no friction, simply using the same accounts and payment instruments that they use for purchases on Amazon.com – without having to re-enter information” explained the company. This option is very similar to what PayPal and Google Checkout offer, allowing customers to keep credit card information on one site while making purchases from several online stores. Amazon FPS will cost merchants as much as five percent of a credit card transaction’s value, which is no bargain. What is worse lower value sales (less than $10) pay a higher rate, really sticking it to merchants with relatively low average sales or those selling inexpensive but high-volume products. This developer-aimed service is not exactly a checkout option either, although Amazon does offer one. Amazon FPS is a payment platform, which a good developer can use to create a lot of features and options. Certainly it is not for every ecommerce store, but for a store that wants to take advantage of complex transactions, tap Amazon customers, or develop configurable payment solutions, Amazon FPS would be a great tool that provides a real competitive advantage.